On Wednesday (December 27), Dion posted a list of his fifteen favorite Doo Wop songs on social media. 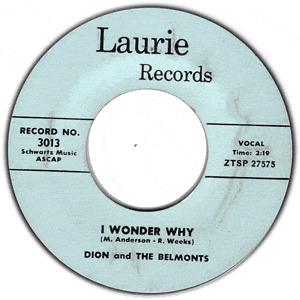 Of course, Dion was an integral part of the development of the genre during his time with the Belmonts and he wasn't shy about putting one of their songs, "I Wonder Why", on the list along with one of his solo songs, "Shu Bop". Topping Dion's list is The Dub's "Could This Be Magic" followed by "Maybe" by the Chantels and "In the Still of the Night" by the Five Satins but, then, he added at the end of the list "I CAN GO ON FOREVER". Dion DiMucci got his first break after auditioning for the owners of Mohawk Records who put the singer's vocal on an already recorded background track, releasing it as "The Chosen Few" by Dion & the Timberlanes. The label also signed Dion's friends, the Belmonts and, in early 1958, released their recording of "I Wonder Why" which went to 22 on the charts but has gone on to become one of the classics of Doo Wop music. The group followed with "No One Knows" (1958 / #19), "A Teenager in Love" (1959 / #5) and "Where or When" (1959 / #3) but, in October 1960, Dion decided to go solo, establishing himself as a major hitmaker with songs like "Lonely Teenager" (1960 / #12), Runaround Sue (1961 / #1), The Wanderer (1961 / #2), "Lovers Who Wander" (1962 / #3), "Ruby Baby" (1962 / #2) and "Abraham, Martin and John" (1968 / #4). A side note. Back in 2011, Dion set the record straight on the recording of "Shu Bop" which had been incorrectly attributed to Dion & the Belmonts. I RECORDED THIS SONG WITH MY GROUP "THE DOO WOP KINGS"
*JIMMY GALLAGHER, *JOE NEARY & *LOUIS COLLETTI. ****IT WAS A LITTLE BIT OF HEAVEN SINGING WITH THESE GUYS. No sin in including possibly the most recognized song in that genre. G_d bless Dion.